In the preceding Q&A, T2 was defined as a time constant for the decay of transverse magnetization arising from natural interactions at the atomic or molecular levels. used as a measurement of those processes contributing to the transverse decay of the MR signal that arise from natural interactions at the atomic and molecular levels within the tissue or substance of interest. In any real NMR experiment, however, the transverse magnetization decays much faster than would be predicted by natural atomic and molecular mechanisms; this rate is denoted T2* ("T2-star"). T2* can be considered an "observed" or "effective" T2, whereas the first T2 can be considered the "natural" or "true" T2 of the tissue being imaged. T2* is always less than or equal to T2. T2* results principally from inhomogeneities in the main magnetic field. These inhomogeneities may be the result of intrinsic defects in the magnet itself or from susceptibility-induced field distortions produced by the tissue or other materials placed within the field. Certain MR sequences using gradient echoes and relatively long TE values are called T2*-weighted. They are used to accentuate local magnetic homogeneity effects to aid in the detection of hemorrhage or calcifications. T2*-sensitive sequences also form the basis for functional MRI (fMRI) using the BOLD (Blood Oxygen Level Dependent) technique. 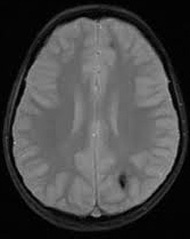 T2* image showing low signal area due to old blood products. where 1/T2i = γ ΔBi is the relaxation rate contribution attributable to field inhomogeneities (ΔBi) across a voxel. Note that the equation is a sum of relaxation rates (1/T2's) rather than relaxation times (T2's). ​If you are still confused, you might enjoy this little song by Greg Crowther from his on-line album, Muscles and Magnets (2004). Twinkle, twinkle, T2*; | How I wonder what you are! | XY signal soon decays; | Why do the spins go out of phase? | Twinkle, twinkle, T2*; | Something pulls those spins apart. | Spin-spin crosstalk sets T2, | But by then T2* is through. | A brief duration here is sealed | By an inhomogeneous field. | Twinkle, twinkle, T2*; | Now I know just what you are! The assumption about line shapes required for the 1/T2* equation to hold true is that they are Lorentzian. Chavhan GB, Babyn PS, Thomas B et al. Principles, techniques, and applications of T2*-based MR imaging and its special applications. Radiographics 2009;29:1433-1449.